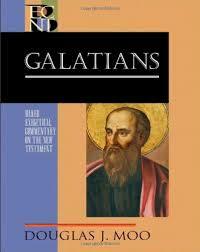 After a couple weeks away from Doug Moo’s commentary, I am back again to discussion his notes on Galatians chapter 3. 3:2 (“hearing accompanied by faith”) – I like Moo’s translation here, but even better I like one of the options he mentions in his discussion – “the ‘hearing’ that Christians call faith” (epexegetical) (p. 183). 3:6 (Abraham believed) – Moo writes, “The meaning of this passage is disputed, but it is best taken to mean that God graciously viewed Abraham’s faith as having in itself fulfilled all that God expected of Abraham in order for him to be in the right before God” (188). I think Moo would be right if the text said “Abraham believed God and God declared him righteous,” but the impression I get from the use of logizomai is that his faith was allowed to “count” (as credit) for something else (i.e., obedience, or demonstrated righteousness). Moo directs God’s “counting” backwards based on what Abraham had already done (“fulfilled,” “expected”), but I think the whole nature of the Genesis and Pauline text is forward looking – it is about what is guaranteed to continue in the future because of the prospective nature of faith itself. 3:20 (“the mediator is not of one”) – for Moo being a translation expert, I am shocked he chose a translation (“the mediator is not of one”) that is so wooden and inelegant. I checked and no modern translation I use follows this confusing phrasing. I think Moo’s rendering is close to NASB: “a mediator is not for one party only.” but I would prefer that over Moo’s option. I am not in disagreement with any of this, but it still doesn’t address the questions of (1) was Paul trying to be faithful to the original context and (2) is this a hermeneutical approach that we today should repeat? 3:24 (“paidagogos” = “guardian”). Moo opts for English translation of “guardian.” Nothing really works well here (custodian, tutor, schoolmaster). Tough to get this right in English! As you can tell from the above notes, my impression is mixed. I like a good many things in this commentary and the best word for most of his notes is “sound.” But I feel like some of his assertions are poorly (or too briefly) argued – especially those related to see believing vs. working in Galatians as a master theme. More to come!